The general theme of our current projects is the improvement of field homogeneity without using up precious space in the magnet gap. Traditional methods for achieving field correction involve passive shimming, using small pieces ("buttons") of either soft or hard magentic materials, and active shimming, using electrical currents flowing through wires laid out along particular paths. Both methods are well-understood technology. Unfortunately, the traditional methods of construction take up too much space to be applied in small millimeter-scale spaces. Traditional button shimming is often impractical in small magnets. For one, the buttons of steel or permanent magnet material are physically large compared to the magnet gap, so they don't fit. A more fundamental issue is that the magnetic field of the buttons is too strong, so that extreme accuracy in field calculations is required for proper design. 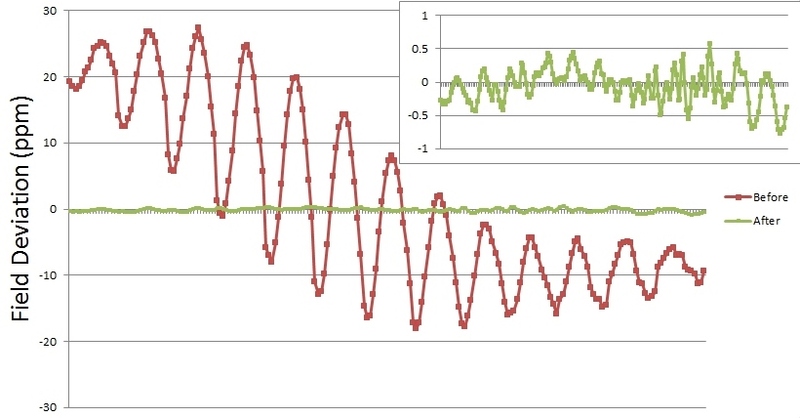 In a small magnet, the required positioning precision is unattainable, but that doesn't really matter because the field calculations are typically in error by 1-10 ppm or more, due to the pole material response in high-field magnets. The end result is that small button-shimmed magnets often have large residual errors, with especially troubling high-order terms. We have developed a method for passive shimming that overcomes these difficulties. It requires very little space for installation in magnets, typically only 0.1-0.3 mm. It uses materials and construction methods that result in shim fields of strength appropriate to the desired correction. The design methodology avoids the generation of high order terms by dispensing with the "button" as the organizing concept. The technique can be applied to essentially any magnet. It is patent pending and available for application to your magnets. Active shimming, using electrical currents on wires, is an essential feature of high-resolution NMR systems. For many years, active shims consisted of separate windings for each mathematical term in the shim set (i.e., X, Y, Z, XY, etc.). The more recent approach is to position wires without the goal of having each individually create one mathematical term, and control the current on the set of wires using a matrix whose elements were chosen to so that each individual term could be produced. 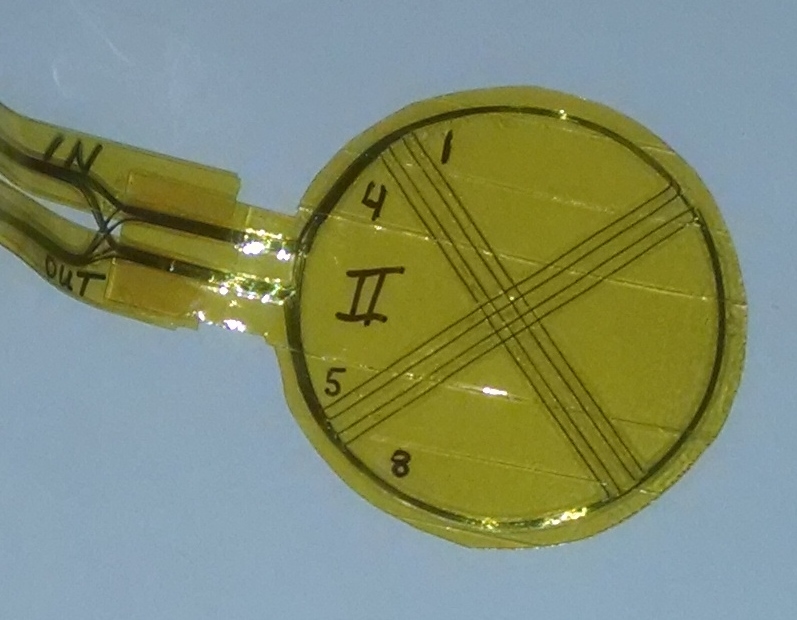 This mature technology works well, but the multi-layer circuit boards used to construct such active shims are too thick to use in the smallest magnets. The main problem is that the current paths, even for matrix shims, can be complicated and require multiple wires crossings, which add thickness. In our patented approach, we dispense with any pretense of making mathematical terms. Instead, we run the wires straight across the magnet poles. By using four directions and multiple parallel (non-crossing) wires, we can produce all the first, second, and third order fields, and all but one of the fourth order fields. A shim paddle showing straight wires in two directions. Four of these paddles, two mounted on each pole face, were used to create fields of order 1 through 4. Two examples of pure mathematical "terms" that have been produced in our prototype are shown below. In both cases, 32 currents have to be set properly to achieve these particular fields. The second order field XZ created by the four-direction active shim set. The third order field (3,1) created by the four-direction active shim set. More information is avaialable in our publication in JMR . This approach to active shimming is patented and available for licensing. One of the major challenges of low-field NMR is sensitivity, stemming from a combination of low field strength and low homogeneity, in comparison to high field systems. One approach is to use long CPMG echo trains to boost the signal to noise ratio, but this has its own pitfalls associated with the interplay between echo spacing and frequency offsets. Our approach is to perform a simple pulse-acquire (FID) experiment in combination with careful optimization and robust signal averaging to achieve remarkable sensitivity for non-hydrogen signals. 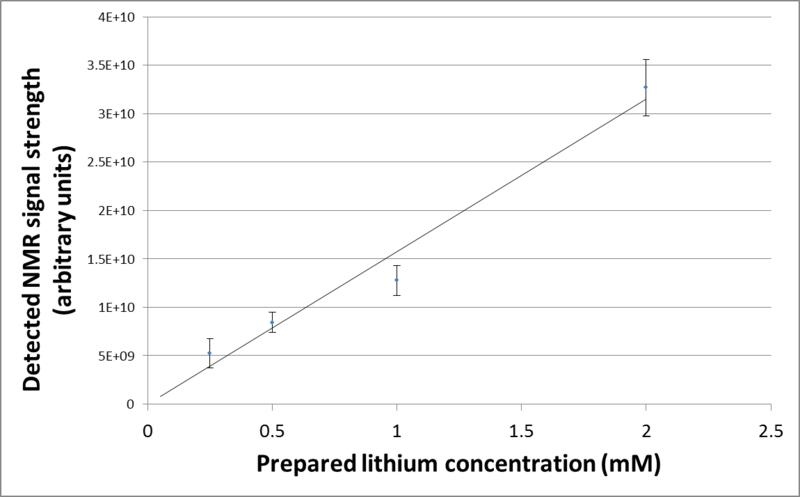 As an example, we have made measurements on a series of lithium samples prepared at concentrations near 1 mM. The resulting measured signal values show the expected linear dependence on concentration. For treatment of bipolar disorder, for example, the therapeutic range for lithium concentration in blood is about 0.5 – 1.5 mM. 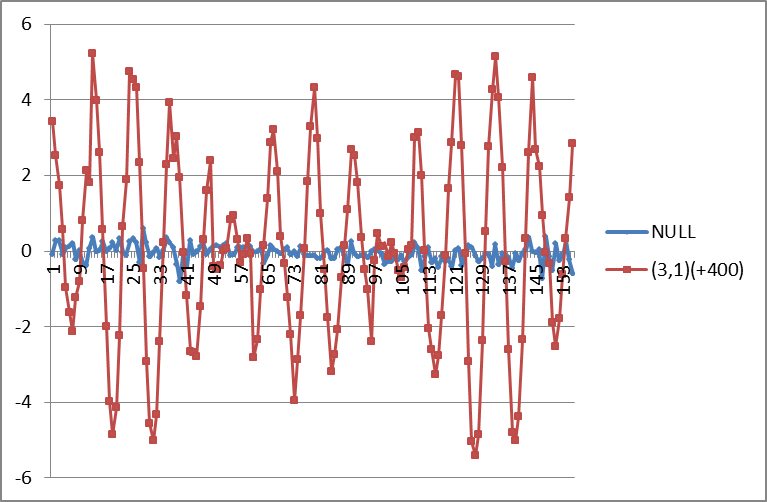 The preliminary data shown here do not quite reach the precision desired, but they are certainly encouraging. A factor of two improvement in the SNR of our experiments would be readily available through basic improvements in the electronics. 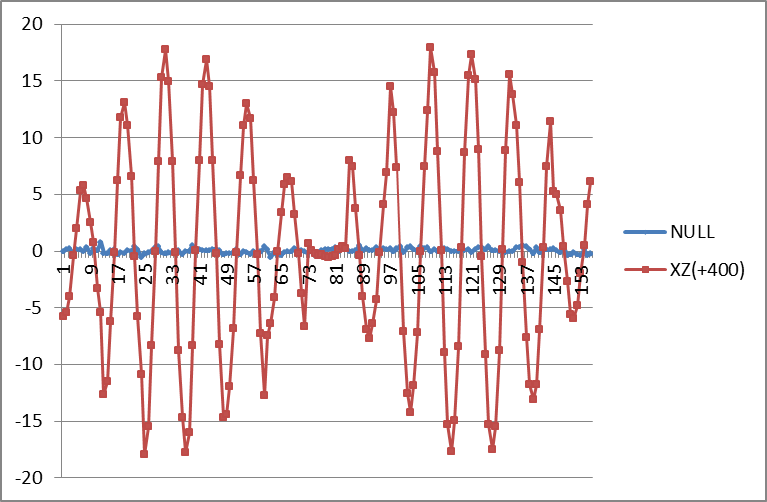 Each of these data points represent about 10 minutes of acquisition time, so there is room for SNR improvement through increased signal averaging. The sample size here is about 0.25 mL; using larger samples will readily increase the SNR. We would be interested in working with a partner to develop this NMR platform into a useful medical device. We are leveraging our advances in highly space efficient passive and active shimming to develop new magnet designs to support fully high-resolution NMR on standard sample tubes in a very small magnet. Our design is not yet locked down, so if you have interest in having us consider the specific needs of your particular project, let us know. We routinely characterize magnets that are difficult to measure. Our measurement technique has a sensitive volume of 0.2 mm extent and field precision of 0.1 ppm for reasonably homogeneous fields. Our typical probe fits a 2 mm by 4 mm access hole. We usually measure fields of 1T and above, but lower fields are also possible. NMR is the best way to achieve this combination of high field precision and small sensitive volume. The map data shown above are typical. These are field values measured at points on the surface of a sphere, with the points forming circles of constant lattitude. The maps for the active shims, for example, consist of 13 circles of 12 points each. The map data are presented in the order they were acquired, circle by circle, from the -Z side to the +Z side. Permanent magnets suffer from field drift due to thermal variations, and typical high-resolution systems must be carefully thermostatted. It is not uncommon for the thermal management system to account for a large proportion of the volume and power budget of these systems. We are pursuing a method for stabilizing the field of high resolution magnets that consumes very little power (and creates almost no heat) while not reducing the magnetic field strength substantially.